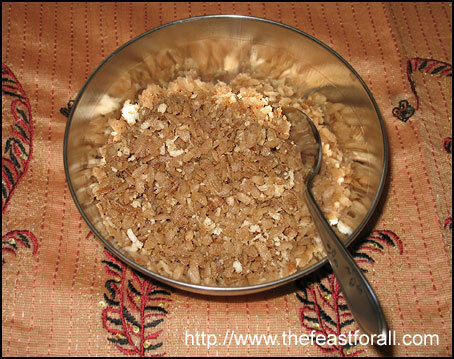 Aval is one of the important savory made during Navarathri. In Sri Lanka, aval from the traditional red rice is very common (actually I have never seen the white aval there). Aval is the beaten rice/flattened rice. Please see http://en.wikipedia.org/wiki/Flattened_rice for more information. Squeeze the water and let stand for about 15-20 minutes. Note: Do not leave aval in water (as in a bowl of water). If you do, it will become grainy. The reason to squezze the water out and leaving for 15 or more minutes is to let the aval get soft.